Our experienced professional ophthalmic photographer uses a special camera to take photographs of the retina before and after a vegetable based water soluble dye (fluorescein) is injected into an arm vein. This test is used to diagnose and monitor diseases affecting the retinal blood vessels. A special eye ultrasound machine is used to image the back of the eye. This is useful for detecting retinal conditions when the doctor cannot see the retina using standard examination methods. A special imaging machine is used to take a cross sectional photograph of the back of the eye and represent the retinal layers and their thicknesses. This is used to diagnose and treat conditions such as diabetic retinopathy, macular degeneration, cystoid macular edema, glaucoma, and others. New medicines to help stop abnormal blood vessel growth and decrease retinal swelling can now be put directly into the eye with minimal discomfort for most patients to treat macular degeneration, diabetic retinopathy, and many other conditions. 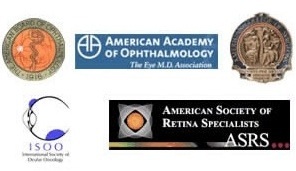 Lasers can be used to treat many retinal diseases in the office. In diabetics, laser surgery can seal leaking blood vessels improving vision and preventing bleeding inside the eye. In macular degeneration, laser surgery with thermal laser or photodynamic therapy can seal abnormal blood vessels to prevent further vision loss. Freezing therapy to the retina can be performed in the office for many disorders. A retinal tear can be sealed or abnormal blood vessels can be closed.